Why Do We Love Canadian Bank Notes? It’s all about the history, artwork, and rarity! Paper money was used in Canada as early as the 1790s. Printing technology advanced and the demand for currency in Canada increased significantly in the 1860s. The golden era of Canadian currency is generally considered to be 1870 to 1930. Not every bank note issued in Canada during this time period is always special. However, some of the most exquisite and rare notes usually fall into that date range. Most people who visit our site are looking to value and sell their currency or get coin values. That always results in one question: How much is my Canadian currency worth? The simple answer is that it all depends on the rarity and condition of your specific bank note. Some notes are only worth face value and others can be worth thousands of dollars. We happily provide free appraisals and always answer emails in a timely manner. With that said, don’t forget to consult our paper money guide. 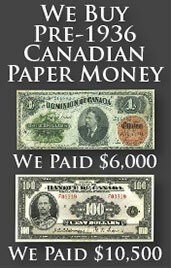 It has pictures and prices for literally thousands of bank notes from Canada. 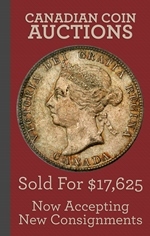 You can also visit the Stacks Bowers website to learn about coin auctions and currency auctions. 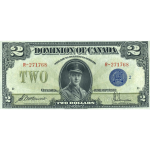 Dominion of Canada Bank Notes: These are probably the most collected type of Canadian currency. Dominion notes were printed from 1870 until 1925. Thirty-nine different design types were issued. Approximately twenty-one of those are considered collectible. Exact values are still based on condition and rarity. 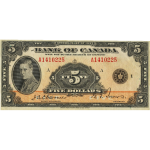 Bank of Canada Currency: These bank notes were first issued in 1935. All Bank of Canada (and Banque Du Canada) currency issued in 1935 is very collectible. Notes from 1937 are also going to be worth more than their face value. Certain varieties from 1954 are in demand as well. Newer notes are generally just worth their stated value. Chartered Bank Notes: These were printed from the 1810s until the middle part of the 20th century. Around 160 different banks issued their own currency. 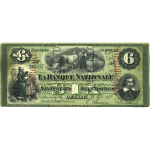 Chartered bank notes were intended to circulate in the local area where the bank was located. They were legal tender throughout Canada though. Each bank issued different designs and denominations. You will definitely need to contact us if you want accurate values for chartered notes.